I flew into Seattle for the weekend. Tickets were so cheap that I couldn’t pass up the opportunity. My good friend Marla rode the train up from Portland and met me at the airport. From there we headed north to the border. Everyone must be going to Canada to get beer too! 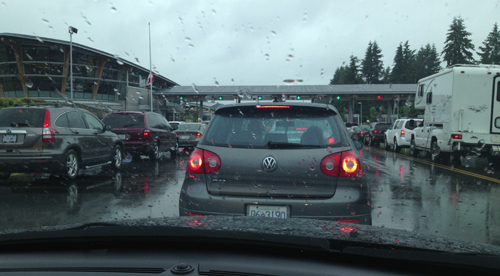 Canadian border crossing outside Surrey, BC. During my travels by motorcycle in Canada the last few years, I’ve discovered a beer I absolutely love, Black Death, a porter from British Columbia. Problem is I can’t get the beer in Alaska. Russell Brewery, with several locations across Canada, produces the beer with limited distribution to the U.S. They are small, which is good! This means they care about the quality and taste. If you live in a couple of states (Idaho is one) you can get the beer from King Beverage (Distributor), or if you live near Bellingham, you might be able to get it at Elizabeth Station stores. 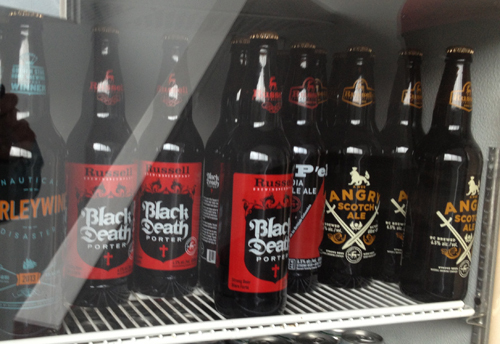 Black Death and Angry Scotch awaiting their transport to Alaska. Naturally, when I learned Russell Brewery was only 2.5 hours north of Seattle, an idea was born. Beer run to British Columbia!I came across the beer when, after riding across the Top of the World Highway (not really a highway, but rather a dusty road riddled with potholes), we ferried across the Yukon River into Dawson. It had been such a long day on account of the condition of the road, that when we took sips of Black Death at Klondike Kate’s it was amazing. Black Death has now become a destination for me over the years. I have bubble-wrapped and carried it in my saddle bags many times. This year when I take on Inuvik, it will be in the bags. 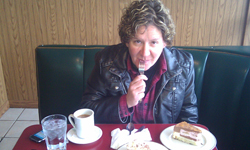 Marla drove north from Seattle on account that I was running on little sleep from flying the red eye out of Anchorage. We crossed the border in no time and rolled into the brewery. The idea was to figure out exactly how much I could bring back without getting into trouble at the border. Not an easy thing to figure out on account that I was in “transit.” How many hours you are in Canada matter, how much you can bring into the country duty free is set, but also how much total you can bring in is regulated. There doesn’t seem to be federal regulations guiding this, so (since you are in transit) it bumps to your state of residency laws. Alaska has complicated laws based on wet and dry villages. I’m from the Municipality of Anchorage, so all this means is I follow regulations for the muni on the State Board website. Clear as mud? Then let’s not forget that airline rules for transporting, and also the liter to ounce metric conversion on the liquid. Suffice to say, I had a guestimate in my head, but I wasn’t entirely sure! I didn’t know how much beer I was going to be able to take back with me. 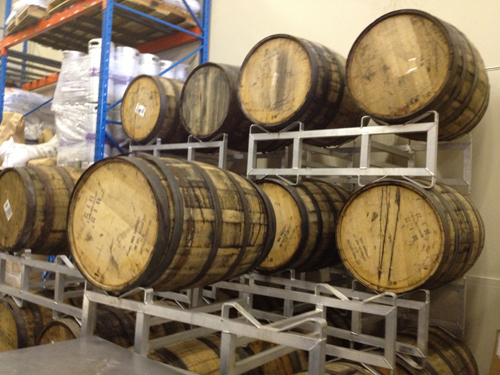 Barrels o’ brew just awaiting for a loving home. We walked in and Katie took care of us! We told her what we wanted, and she gathered the beer up for us. Steve the operations manager came out and chatted with us. When he found out how far we had traveled to sample their beer, he warmly offered to give us a tour and meet the staff. We wandered out and learned all about their process and operation. These guys love beer. It is very much their passion. We met Jack, who was in the process of making a batch of Angry Scotch Ale. We chatted about how he got into making beer; he was a high school math and physics teacher turned brew master. Jack took us all around and hooked us up with a few samples. Jay, another employee, also shared how much he enjoyed the craft. 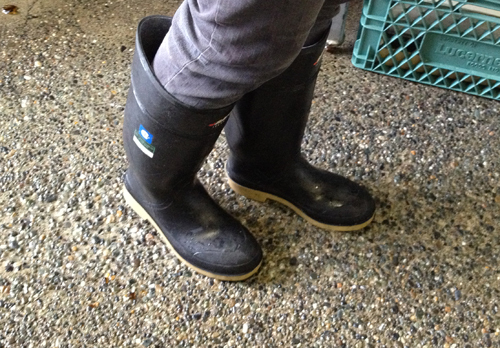 The smell of beer and the sounds of rubber boots squeaking on the floor were wonderful. What does fishing for salmon in Alaska and beer brewing have in common? A good set o’ boots! We spent so much time at the brewery that we needed to rush to make the ferry. Marla had forgotten to print the ferry tickets, so we asked where we could print them out. We were directed to the library. Apparently, Surrey, which is a small town, had THREE LIBRARIES. We got there and the parking lot was packed. A ton of people were hanging out in the LIBRARY! Wow, what do the Canadians know that we don’t?The folks at Russell Brewery sent us out the door with complimentary tee shirts; and Katie figured out the exact amount of beer I could take back while we were touring the shop. We bought just a little bit over the limit to enjoy while touring Vancouver Island. I was amazed… the library… wow… I’m still amazed even a day later. They actually use their libraries! Think about that. Wow.